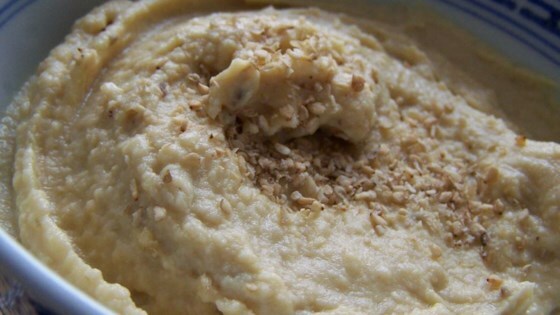 "I make this hummus all the time. It only takes a few minutes to prepare, and it's healthier without the oil. Increase or decrease the ingredients as desired, especially the jalapenos! Serve with pita chips or fresh veggie slices. Add more of the reserved bean liquid for a smoother dip." In a blender or food processor, combine garbanzo beans, jalapeno, cumin, lemon juice, garlic and 1 tablespoon of the reserved bean liquid. Blend until smooth. This did not taste like the hummus I have had in restaurants. The jalepeno's are strange, not adding to the normal greek flavor. We ended up throwing it out. I would not make this again.